This week was the 4th of July, so it was a short work week. 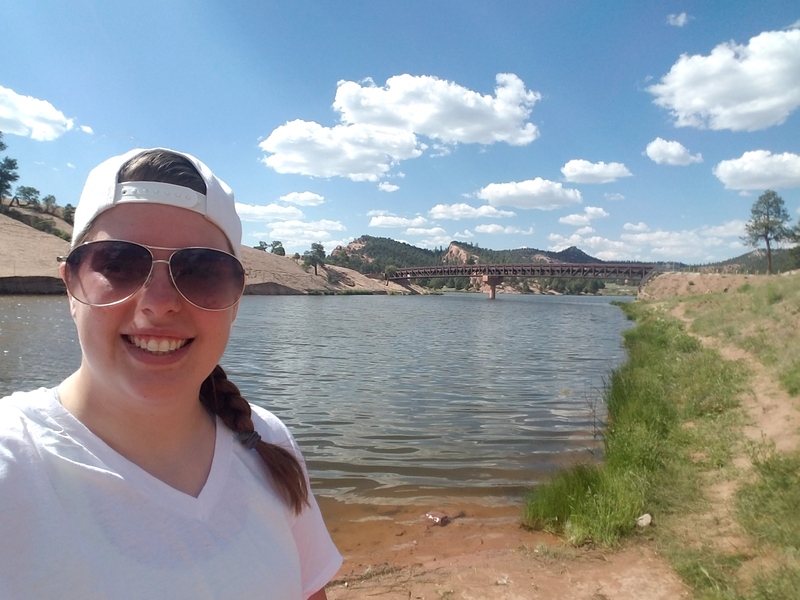 On Monday I went to the lake with a friend and her daughter, and it was pretty fun. You couldn’t swim in the lake, and we didn’t have fishing poles so we pretty much just spent some time throwing rocks and seeing if we could skip them. The lake itself was pretty, and it was definitely a change from the rest of the scenery close by that’s all very dry. I didn’t really do much on the 4th, but it was nice to have a day just to relax. I went over to a friends house for dinner and we watched a movie, but other than that it was pretty much just a day of relaxing. On Friday I went to the rodeo with a couple of friends, and it was not at all what I was expecting. It was cold and rainy while we were there which probably didn’t help things. We had gotten there a little bit late, but we were still in the front row of the second section. It was a bull riding competition, but all I really could see was a bunch of bulls running around with no people riding them. We stayed for about an hour, and as we were leaving we finally saw a guy ride for 6 seconds, but I still don’t think we could have seen him from our seats. It was an interesting experience, and I think I would have enjoyed it a lot more if it wasn’t raining. On Saturday I did some local exploring. I visited the Navajo Nation Zoo and Museum. The zoo was really cool. The animals were mostly rescues and endangered animals. It was really hot, so a lot of the animals were hiding, but it was still really cool because it addition to some of the facts about the animals, there was also information on how the different animals fit into Navajo tradition and storytelling. It was really neat getting to read about the animals and see how much the Navajo respect and revere so many of the animals. The Navajo museum was alright. It is a pretty small museum, and had one exhibit hall open. The museum is a combination of art and history and tradition, but the layout was a little mixed. It was hard to get a flow walking through. There were several pieces that were really powerful and cool to see, but no photography is allowed. Sunday was the bigger day this week. 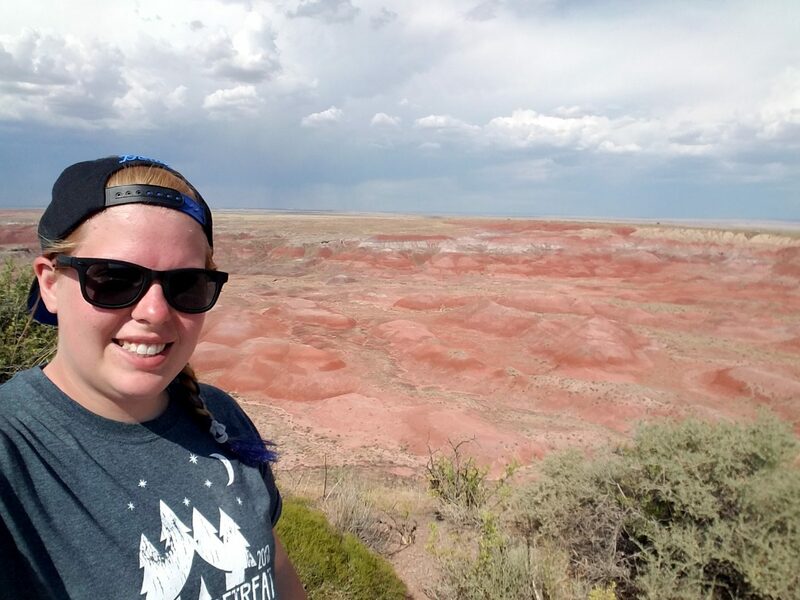 I spent about 7 hours at Petrified Forest National Park. It was unlike anything I had ever seen before. The park has a 26 mile road going through it with visitors centers on both ends and various overlooks and short trails along the road. I started in the South end and did (almost) all of the trails and overlooks, and the whole trip was amazing and gorgeous. The South end of the park features a lot petrified wood, and the outlooks are not as close together as the North end. The South end also features most of the easy walking trails. The trail that I missed was the Giant Logs trail which is right behind the Rainbow Forest Museum. You can see a lot of the logs through the window of the museum, but I didn’t realize there was a whole trail through until I had already left and was at a different stop. There are 2 other trails near the museum that I did do, The Long Logs and Agate House trails. These 2 trails share a common .4 mile access trail, and then each trail is about 1 mile. The Long Logs trail is a loop through an area where there was a log jam in a river and the wood has now petrified, so it features a lot of petrified wood and it’s pretty neat that you can see the history of what used to be a river a long long time ago. The Agate house is an out and back trail to a reconstructed house made of petrified wood. It is the only resconstruction in the park, but the signs say they have found evidence of other houses similar to it, but that reconstructions aren’t generally done anymore as more can be learned from leaving sites undisturbed. The access trail is fully paved, and the Agate House and Long Logs trails both have some areas of more loosely packed gravel, but both are pretty well defined and easy to walk. I chose to do these 2 trails and then visit the Rainbow Forest Museum to cool off after. The Museum is pretty small, but has a ton of information on the fossils and ancient plant and animal life in the area. It also had some really neat comparisons and insights into how researchers know what they are looking at. It was also really neat to see how recent many of the discoveries were and to know that research is ongoing in the park and new things are found all the time. The next outlook and trail are the Crystal Forest. From the parking lot you can see a decent amount of petrified wood, and it’s a pretty good view of the area around as well. The trail is about .8 miles and is a loop through the area to see more of the petrified wood. There are also points along the trail that provide really nice views of the surrounding area. The whole Crystal Forest trail is paved, and for the most part it is pretty flat. There are some small hills, but for the most part it’s a very easy trail. After the Crystal Forest there are 2 more outlooks that have decent concentrations of petrified wood, the Jasper Forest and the Agate Bridge. Jasper Forest is pretty neat because it used to be the first point of entry and sighting of petrified wood for travellers. It is the closest large concentration of wood to the railroad tracks, and historically used to serve as the greeting and entry into the area. There were several photo comparisons at this site and throughout the park that show how little things have changed in the past 120 years or so which was also really interesting to see. 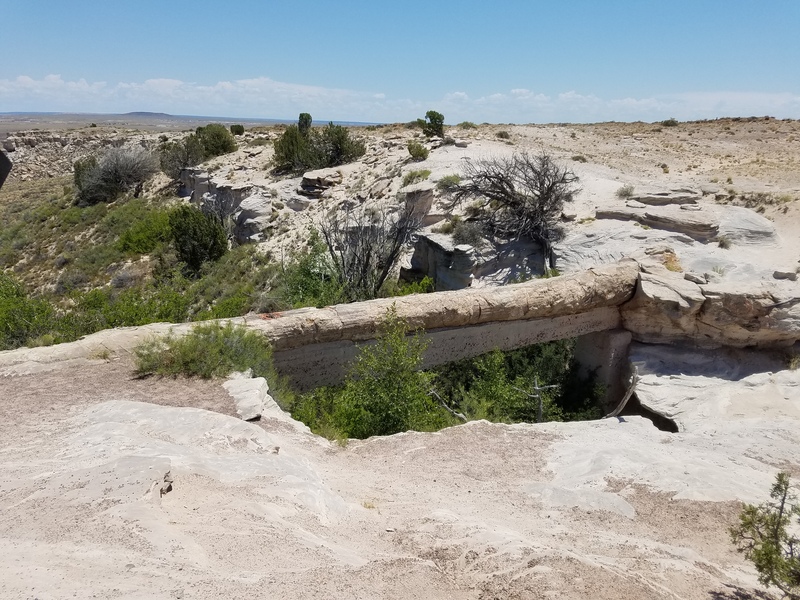 The Agate Bridge is a quick look at a spot where a large tree fell down and was then petrified before water eroded a large passage underneath. The bridge spans 110 feet long and the tree has been supported by concrete since 1917. There are spots where the concrete is wearing away, and the Agate Bridge serves as a neat reminder that nature and water can be more powerful than human intervention sometimes. The scenery changes in the middle of the park as you enter the badlands. The first major area in the badlands is the Blue Mesa and Blue Forest trail. The Blue Mesa area is a 3.5 mile driving loop with several overlooks along the loop that provide awesome views of the badlands. The Blue Forest trail is a 1 mile trail that goes down into the badlands and provides some amazing views from below. The whole trail is paved, but there is a section that is very step that hairpins several times along the edge. After getting down, the trail is a loop that provides beautiful views from multiple angles in the badlands. Because of the steep incline, this trail was probably the most difficult in the park, but it also provided views that weren’t like any of the other views in the park so it was well worth it to me. There are a few more stops to get views of the badlands called the tepees, though they are more like pull offs than actual outlooks. The did provide some cool wide views of the badlands, and were easy, quick stops to make. After the badlands there are a few stops that show more recent history of the Pueblo people who lived in the area. The first stop is Newspaper Rock and features a Petroglyph. I had some difficulty seeing the different petroglyphs on the rocks because they were pretty far away from the actual overlook. I also don’t know that I was necessarily patient enough to get a good view. There were several view finders, but I ran into more people at this overlook than any other and didn’t want to wait around too long. The next stop is Puerco Pueblo which is a small set of Pueblo ruins. It is also the first stop with a bathroom after the Rainbow Forest Museum, and pretty much the only bathroom in the middle of the park. The Puerco Pueblo stop has a .3 mile trail that walks you through the village and points out different aspects along the way. It was neat to see how similar the building styles and techniques were to the other Pueblo ruins I have seen. Even though they are hundreds of miles apart, the spread of ideas, techniques, and important symbols spread throughout the whole area. Puerco Pueblo is sort of the last stop in the Southern end of the park. The first stop in the Northern part of the park is historic route 66. The original route 66 is marked by old telephone poles, and the spot where it crosses the current park road has a bench and an old Studebaker to commemorate the spot. After the route 66 stop, there are 3 spectacular overlooks of the painted desert, Lacey Point, Whipple Point, and Nizhoni Point. All 3 provided amazing views, and I kept thinking that it couldn’t get more amazing or beautiful, and I always seemed to be wrong. It was amazing to see how vast and expansive the area was. The next 2 overlooks were Pintado Point and Chinde Point. Both of these outlooks provided a little bit more of a rim look over the painted desert. 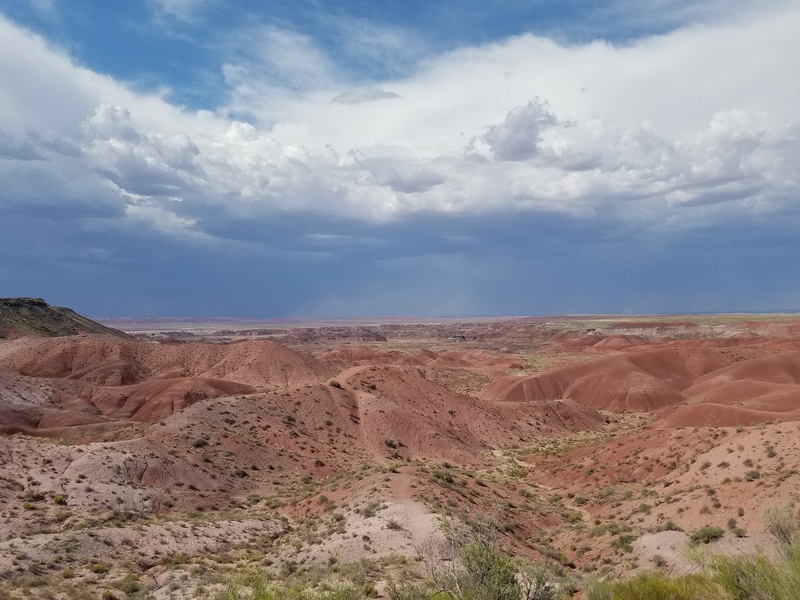 It felt like I could see the painted desert going on for miles and miles in the distance. Chinde Point also has a nice large picnic area and looks like it would be a nice meeting area for large groups. The next stop was the Painted Desert Inn. It was really neat to get to see human interaction with the park throughout time. The Inn underwent remodeling and major changes in the early 1900s, but has remained pretty similar since then. The upstairs area is still set up like it would have been years ago and features several pieces of art by a native artist that were beautiful. Downstairs they have turned the old bar into a a fountain and ice cream shop. The Inn also has an overlook behind it and marks one end of the rim trail. The Rim Trail is a .5 mile trail that connects the Inn and Tawa Point. The trail is the only completely unpaved trail in the park, and was a little harder to follow than the other trails, but the views along the way were awesome. Every time the trail came upon a new overlook of the desert it was amazing to just look out and see the beauty. The trail also had several informational signs about the animals, plants, and history of the area. I walked from the Inn to Tawa Point along the trail, but ended up walking back along the road because of the paved surface. It was a pretty easy hike with amazing views the whole time. The last stop in the park is Tiponi Point. Tiponi Point provides more of a length wise look down the painted desert. While most of the other outlooks provided more expansive, wide looks over the desert, Tiponi provides a narrower look, but it is still amazing. It also provides a great opportunity for a last or first look at the desert depending on which direction you travel through the park. I finished my visit ans the Painted Desert Visitor Center. Unlike the Rainbow Forest Museum, the Painted Desert Visitor Center doesn’t feature any exhibits. It does however screen the 2 park videos and have a gift shop. The videos were neat in that they showed the connection and importance of Petrified Forest National ark in so many different fields of research today. It was also nice and cool in the Visitor Center and provided a great place to relax for a few minutes before ending my day at the park. 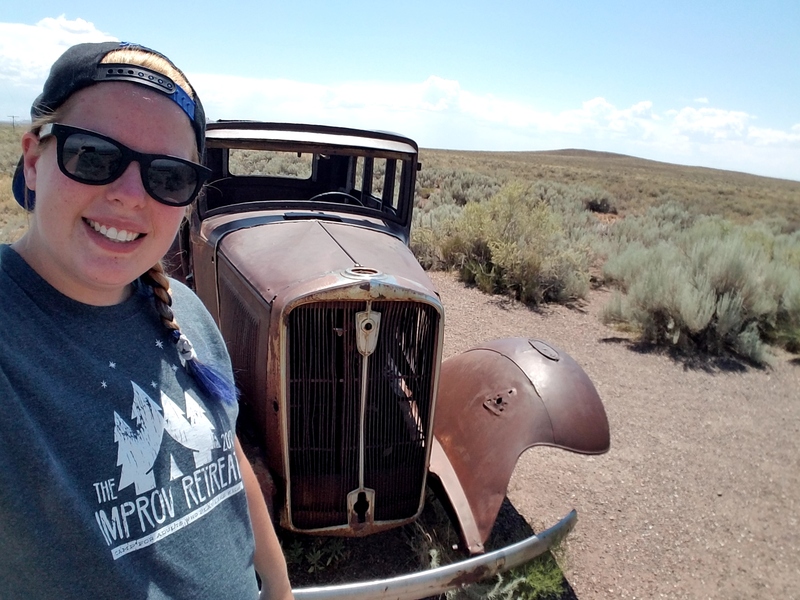 Entry at Petrified Forest is $20 per car (or included with the annual pass) and well worth the money. The views and history are so rich that it’s a definite must do for the area. Overall this weeks adventures turned out to be more than I was expecting. I saw so much and learned so much just from visiting the places near me.